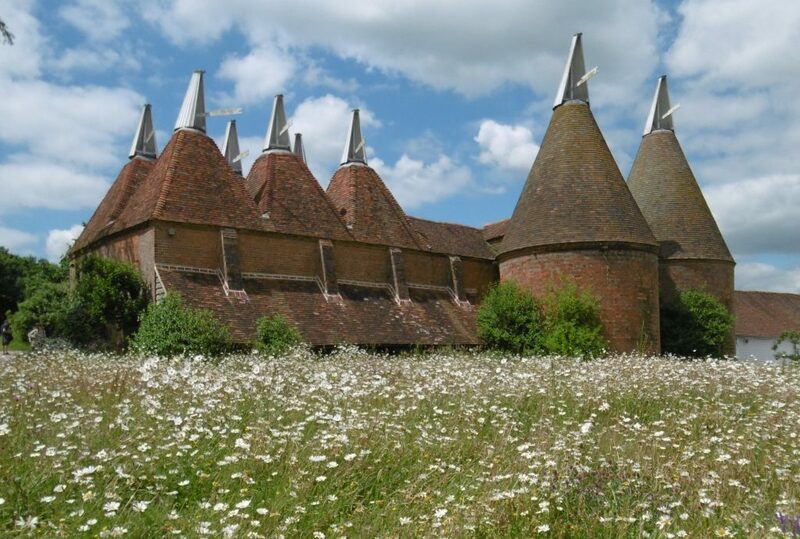 Oast houses and hopkilns are farm buildings for drying hops, an ingredient in brewing beer. They are a distinctive feature of the landscape of South East England and the West Midlands. This website, created by Patrick Grattan, is an illustrated history of how these buildings have evolved over 450 years. 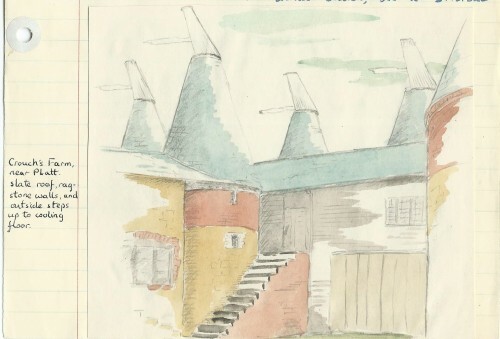 17th Century: Little Golford (Godwin House); early “barn style” kilns; West Midlands “internal” kilns in converted buildings and barns; malthouses; Kent and Sussex Wealden oasts; Catt’s Place, Paddock Wood; Kenward Farm, Yalding. 19th Century: Hop picking; the age of the roundal; the West Midlands; furnaces and air currents; hop pressing and bagging; the cowl; 19th Century variants and eccentrics; the come back of the square kiln. I have included a section at the end on hop houses in the USA, drawing on the work of Michael Tomlin, Tinged with Gold, Hop Culture in the United States, 1992, University of Georgia Press. An account of hop drying in Bavaria and Bohemia has yet to be added. Tasmania and some States in the Pacific North West and MidWest of the USA are the only other places in the world where hop kilns comparable to English hop kilns can be found. 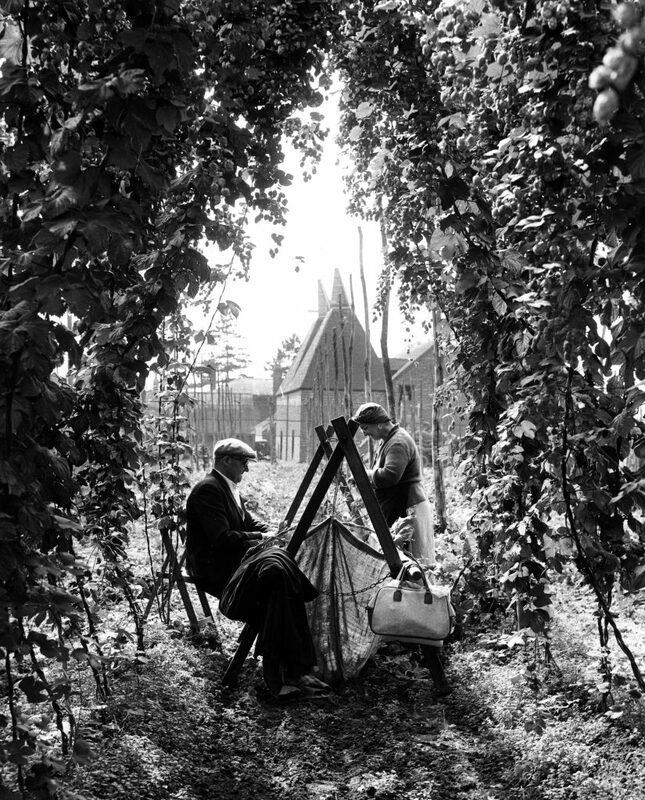 As a child growing up in the 1950s in Kent hops were part of the local scene: in winter the skeleton structure of tall hop poles in the hop gardens; in summer the luxuriant growth of the hops with their light green flowers up to 20 feet high; in September the picking and drying season. I joined the visiting families from East London picking hops and earning pocket money. The sulphurous smell of hops drying in the oast kiln, known as reek, drifted across the landscape. 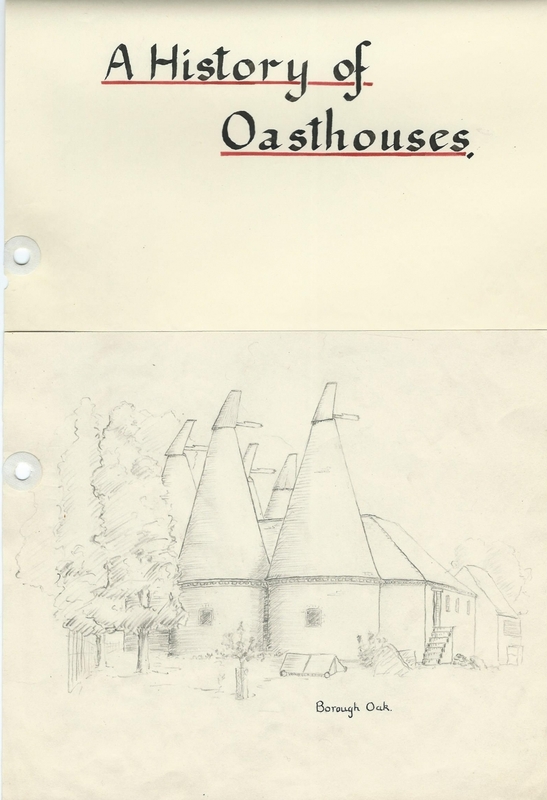 In 1960 I researched and wrote an illustrated paper, The History of Oasthouses for a University scholarship scheme. Illustrations from that paper are combined with updated information and pictures of what has happened in the past half century. The significance of these 1960 descriptions and illustrations is that they capture a moment in time when there was still a major business of hop growing and drying in England, just before it went into sharp decline and almost disappeared, with consequences for oasts and hop kilns as a feature of the landscape. 1960 was the last year that Hopper Special trains were run from East London to bring pickers to Kent and Sussex. Mechanical pickers were taking over. The 500+ working oasts and hop kilns that I visited in 1960 were down to 70 operating in the mid 1990s. From the 1980s the conversion of oasts to homes in the South East became widespread. Stylish residences, often with round reception rooms, became a desirable feature of the property market. The older oasts became Listed Buildings. Most internal fixtures and structures disappeared but the typical silhouette of oast, kiln and cowl has been widely preserved. 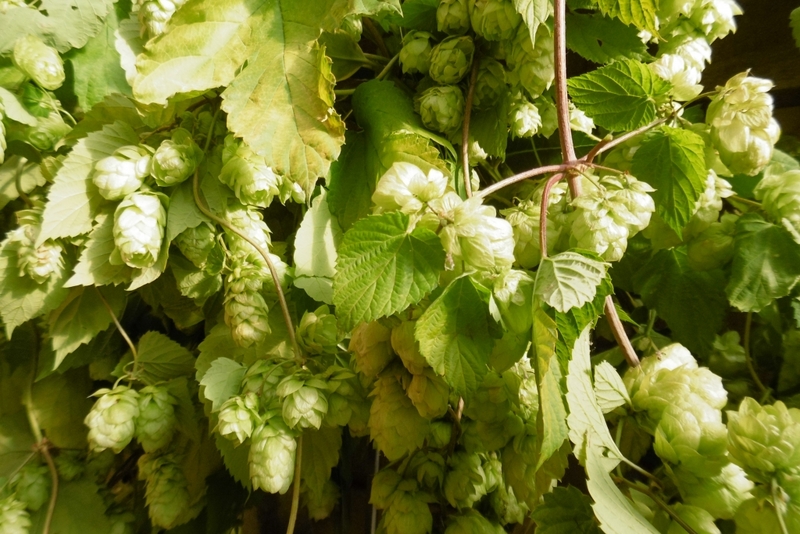 Only in recent years has hop growing and drying started making a 21st Century come back in response to the popularity of craft beers, marketed for their choice of hop and malt varieties. The idea for this research came from a Priest ministering to Londoners picking hops at the largest Kent hop enterprise, Beltring by Paddock Wood in Kent. (There was a long tradition of missions by the Temperance Society and others to the hop pickers.) I spent the summer of 1960 scouring the countryside in a 1938 Austin 10 car to record oasthouses and to try to discover the earliest buildings which would help build up a picture of how the architecture of oasts had evolved over 450 years in Kent, Sussex and to a lesser extent Surrey and Hampshire. I studied books on hops and husbandry from the 16-19th Century and met many experts. No comparable recent research appeared to exist. With youthful exuberance I concluded that I had broken new ground in understanding the architectural history of oasts and hop kilns. However, with one exception in the 1970s no use was made of my material; it lay dormant in a cupboard. In the intervening years there has been more extensive research and writing, for example in the detailed account of Kentish Oasts by the Waltons. See Bibliography. The website incorporates the more recent material. The drawings and diagrams are not of a standard that would be expected from an architectural student, but are presented as they were executed at the time. 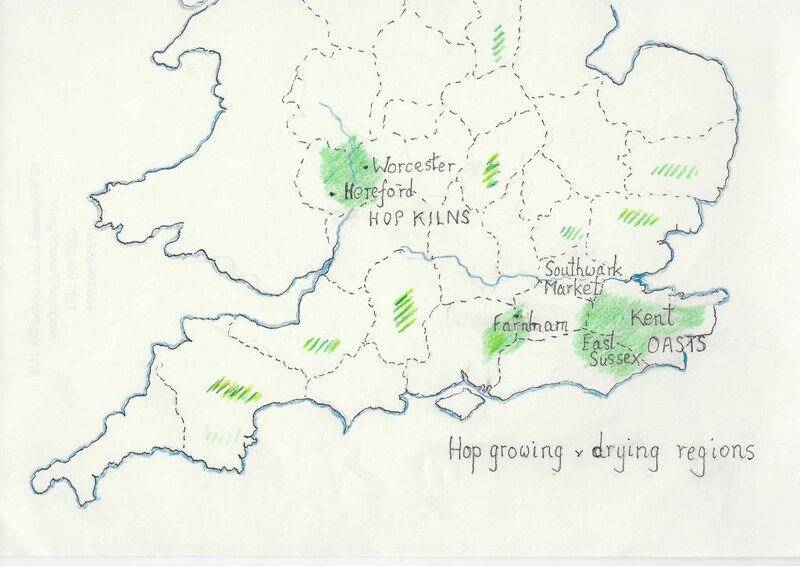 My 1960s studies touched lightly on hop growing and drying around Farnham and did not include the important West Midlands, Hereford and Worcestershire hop region . 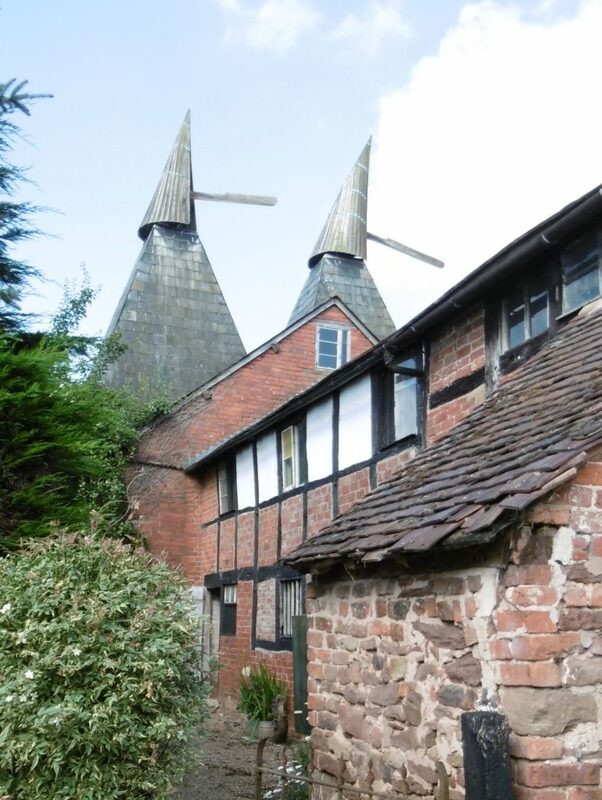 In depth surveys of hop kilns in the West Midlands (the term oast is not used there) have been completed in recent years and the Bromyard History Society has published a history, A Pocketful of Hops. I have drawn on these for this website’s account of West Midlands hop kilns. There are now (2016)as many hop growers and dryers active in the West Midlands as in the South East. This is in sharp contrast to 100 years ago when the West Midland made up little more than 10% of the English hop industry. Of the many disused hop kilns in the West Midlands more remain disused and unconverted than in the Home Counties. Most of my survey was based on external rather than internal architectural evidence. I will have missed many early oasts that showed no visible sign on their exterior of their erstwhile role. In the last 50 years the most significant new evidence about early oasts and hop kilns has come from surveys of historic buildings, in East Sussex by David and Barbara Martin and Gwen Jones and in the West Midlands by Edward Peters. I have taken account of this work in the text on this website and included some images from their extensive photographic libraries (see references). I am grateful for the opportunity to draw on their material, all far more professional than my work. While the illustrations are unchanged, the text of my 1960 report has been replaced by an updated script. The West Midlands: welsh slate roof, pointed cowl, dark hued brick, red sandstone and timber framed stowage. Moor Court Farm, Eggleton, Herefordshie. Organising the story chronologically has hazards. Dating old farm buildings is difficult and deceptive. They may be built with recycled materials. They may have been built for one purpose and converted for use as another. Evidence that a building has been used for hop drying does not prove whether this was its function for some or all of its life. For convenience individual oasts and hop kilns are grouped on this website by century, but this does not imply certainty about the dating of buildings. One of the fascination of oasts and hop kilns is that each one is slightly different from all others. There do not seem to have been standard templates used by farmers and builders. There is every permutation of round, square and rectangular kilns of different shapes and sizes, as the 19th Century section of this website illustrates. The term “barn style” is used for the 16-18th C buildings which look from the outside like any farm barn or shed. It was only with the development of tall square and round kilns from the later 18th C onwards that oasts and hop kilns took on the image and silhouette with which they are associated now. This web site is work in progress. It is a far from complete account of the past. I echo the words of William Marshall a well known agricultural writer of the 18th Century who said of his Rural Economy of the Southern Counties, 1798: “if I have not reached perfection, let it not be ascribed to the difficulty of the task, rather to want of application”. All those who have information to offer, or want to make an enquiry on oasts and hop kilns, whether individual buildings or more generally, are warmly invited to get in touch and contribute to up-dating and improving the site. Information about any buildings containing evidence of former use for hop drying, and old photographs of oasts and kilns would be especially welcome. Please go to Feedback and Contact.